A range of louvres offered with a double bank chevron configuration, either contained within a box frame surround or offered with concealed mullions for continuous appearance over large areas. Particularly suited to situations where the blockage of an unrestricted line of sight through the louvre (i.e when viewed from below) is required. 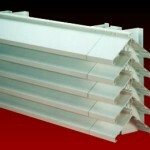 A wide range of Chevron louvre profiles offers a selection of performance levels to suit individual project requirements. The unit was subjected to a series of independently controlled tests to determine the aerodynamic performance of the design. Offered in a wide variety of materials to include aluminium & steel, either in mill finish or post coated. Also available manufactured using pre-coated materials. Aluminium alloy units in aluminium sheet to BS EN 485 or aluminium extrusions to 6063 T6 supplied in either mill finish or with a polyester powder paint finish (including Syntha Pulvin) with a wide choice of colours and gloss levels. Other standard finishes to aluminium include anodising in Natural Silver or coloured Anolok II. Steel units manufactured using galvanised steel in mill finish or with a polyester powder paint finish (including Syntha Pulvin). Pre-coated units manufactured using Plastisol, PVDf or Colorcoat coated substrates in a full range of colours. Also available using stainless steel, zinc, copper or bronze sheet materials. A range of Chevron profiles, supplemented by bespoke sections available to suit all needs. Fixing flanges may be formed to whatever mounting detail is required. 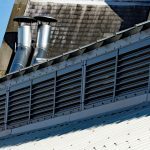 With flanged louvres, the box depth can be manufactured to fit inside or outside the building line as required. Expanded metal bird guards, security guards or fly mesh can be fitted internally or externally as required. Where units are to be mounted in continuous horizontal runs, joining plates are supplied.